The male effect refers to the effect of the introduction of the male on the oestrus cycle of the ewe. There are farmers who have in the past placed the urine soiled hair, of the ventral abdomen and legs of rams, in bags attached to the fence of the ewe camp to relicate the ‘ram effect’. 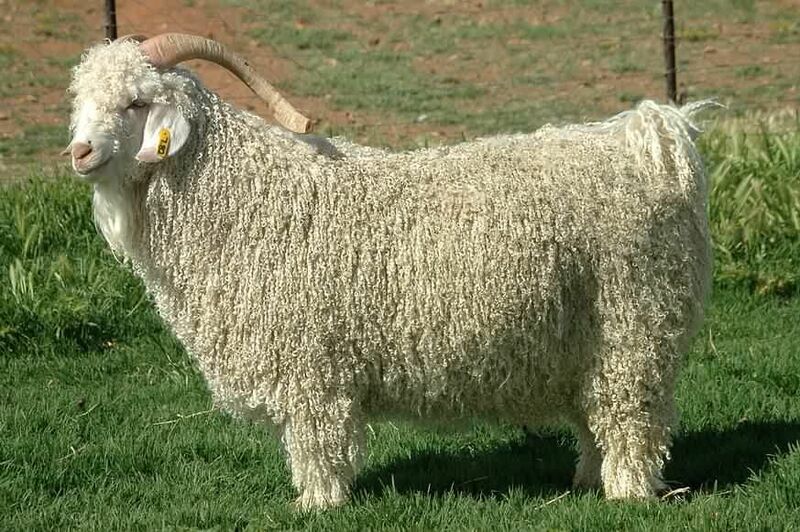 This hair has the characteristic ‘goat ram smell’ during the breeding season. It was initially believed that the pheromones played the pivotal role in the ‘male effect’ but work since (Martin et al 2004) has proved that visual and behavioural stimuli are as important as smell and hence the use of Vasectomised ams(teaser rams) is much more effective. What does the presence of the ram do? How long do the ewes need to be exposed to have an effect? A response is seen after just a few hours but studies show evidence that long term exposure for has a far greater effect. Teasers are kept in for 10-14 days (usually 10). About 60% of goats will exhibit heat with the first ovulation. The ewe cycles again 19-21 days later. –Second Peak between 20-25 days after ram introduced. Angora ewes have more synchronised heat periods than sheep after ram introduction and hence more compact kidding periods. 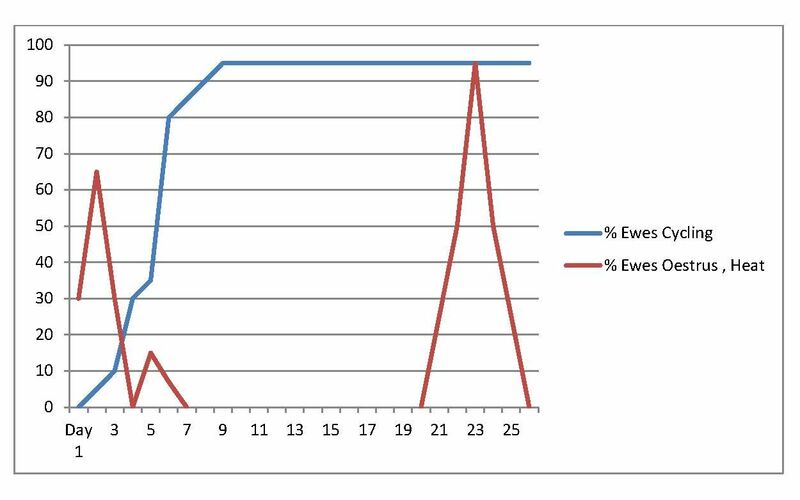 The 2nd ovulation has a 4% better ovulation rate than the first - another benefit of teaser ram use. 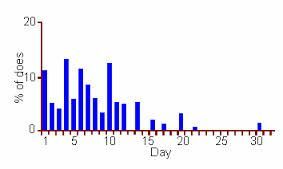 Kidding is becomes more synchronised with most ewes kidding within a two week period as seen in the graph. % ewes kidding after first ewe kids on day 1.